Our Dressage queen Holly comes all the way from the UK. From a small town in rural England Holly has a long riding career and has had a go at most disciplines from dressage to eventing. 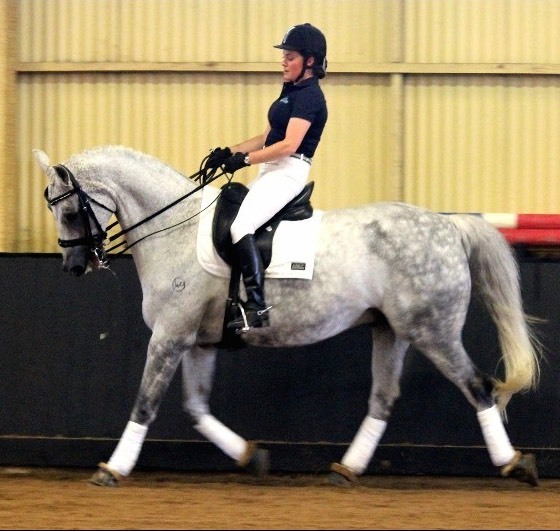 Holly worked extensively in riding schools in the UK bringing on young riders and coaching them through all levels. Holly also works with clients with their own horses as she has extensive knowledge of training. Holly completed her Bachelor of Science Degree in Animal Management and Behavioral Studies and was running a large yard and riding school in the UK when we poached her. Holly came to Australia in 2011 and began teaching our Camp programs straight away. She fit the team like a glove and has been a great asset to the team ever since. Holly searched long and hard for her Equine partner and finally found she was sitting on her doorstep all along. Holly has worked very hard with the retraining of her horse Miss Fergie. Holly has worked hard with the dressage going up through the HRCAV levels now to the EA dressage circuit. We are incredibly lucky to have Holly she brings such great knowledge and expertise to our team. Riding school Manager Linzi is another UK import. Coming from a non horsey family in the UK Linzi made her riding debut at the age of 4!! Hooked on horses she got her first pony at the age of 8, proving that she wasn’t quite ready for a pony she started helping out at her local riding school. Spending every minute down at the yard she did everything to be able to ride. Riding the more difficult horses that nobody else wanted to ride taught her much about training and dedication. After many years of lessons and training other peoples horses she began to compete horses for clients. Mainly showjumping based Linzi qualified for HOYS (horse of the Year Show) on a clients horse in the Working Hunter Horse section. After many years of teaching and training she then decided to take a gap year to travel around and teach and compete in America. Whilst in America she had the opportunity to ride some amazing horses and competed in a local county fair. This gave Linzi a greater understanding of the wider equestrian community and disciplines. 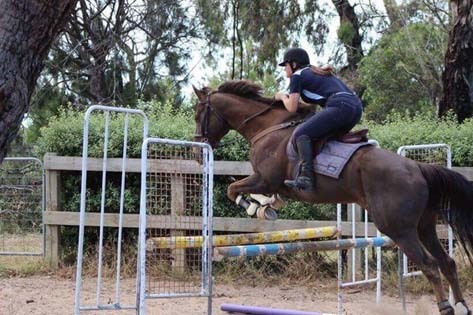 When coming to Australia her riding career slowed somewhat, to concentrate on her family but is still a very knowledgeable and organized member of our team. Linzi has her BHS Level one and over 15 years experience teaching horse-riding and nurturing the next generation of passionate horsey folk. Charlotte Burns is our all round horse expert. She has competed in all riding disciplines at a very high level. 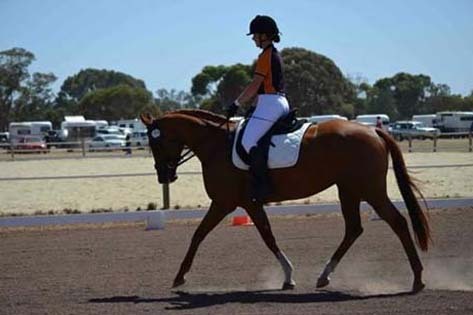 She started her professional riding career at age 16 and has achieved many incredible things, notable completing the prestigious Australian International 3 day event, and taking her beautiful horse Masterful all the way from an unbroken baby Warmblood to currently competing at Pre Saint George level Dressage. 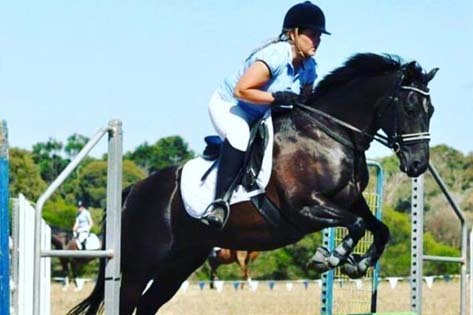 She has successfully broken in many horses and also won the best all-rounder Champions Young horse competition on her horse Williow who she broke in and trained herself , this is the most prestigious breeders and trainers competition in Australia. Charlotte has her NCAS Level One coaching qualifications and over 15 years experience coaching beginners to experienced and seasoned competitors. Charlotte has taken a number of riders through from total beginner to state level winners. Dirk is an accomplished rider and competitor, with more than 40 years experience. He has won a number of State and Australian national dressage championships since moving here from the Netherlands. In the Netherlands, Dirk competed primarily in show jumping events. When he moved to Australia (with his then wife Sicca) in 1982, The Dijkstra’s purchased the Australian Equine Academy from its, founder Fred Hoevenaars, husband of well known Australian International Judge Susie. It is this business which forms the basis of today’s AEA Dressage, although along the way Dirk’s interests and skills have expanded and developed. Dirk has conducted clinics throughout Australia, China, Japan, Malaysia and Indonesia. Dirk is one of a handful of Dressage Riders in Australia who is out competing at the highest level as well as Instructing. He has had many years experience as a mentor to working pupils and has produced some of Australia’s best riders such as James Patterson Robinson. He has competed at the highest possible level in all Olympic horse riding disciplines and is ready to pass on his knowledge and experience to the next generation of equestrian enthusiasts. Kelsey is our upcoming superstar instructor and rider, who started volunteering at her local riding school when she was 13 and has been working with horses ever since. Kelsey fell in love with dressage when she was 16 and is currently training her young warmblood and preparing her for the competition environment. She has been instructing since she was 16 years old, teaching dressage, show jumping and cross country to people of all ages. Kelsey works very well with young horses making sure she is kind yet firm with a patient and consistent work ethic. All the Wallington Park students love to learn from Kelsey, as she has a fun, energetic approach to her teaching and her student’s progress quickly under her guidance, whilst maintaining their passion for all things horsey.